You will see the term “big movement rocks” often in this book. The big movement rocks consist of the foot and ankle complex, the hips, and the thoracic spine. Human movement is the culmination of a cascade of tri-plane motions resulting in a desired outcome, whatever that may be. Efficient motion of the big movement rocks improves efficiency of motion and will reduce the risk of injury. Depending on which resources are cited, the top three injuries affecting people are low-back injury or pain, knee injury, followed by shoulder injury. My experiences over the last 37 years of practice have shown that repeated incidence of improper motion in the big movement rocks significantly contributes to overuse and chronic injuries. Working closely with Dr. Robert Masson of the Neurospine Institute, I have seen many of his patients exhibit similar tendencies in movement. After evaluating their results from a gait and motion analysis, invariably we find tightness in the hips and thoracic spine in one or more planes of motion. Anatomy shows us that the low back is “stuck” between the hips and thoracic spine. Chapter Two, A Three-Dimensional Joint-by-Joint Approach to Movement taught us that the hips are greatly affected by the foot and ankle complex and must be included within the scope of our assessments. The knee is a victim of the foot and ankle complex and the hip. The tibia is greatly impacted by foot function and the femur is affected by hip motion, and so we see how the knee reacts to the structures above and below it. When people present with knee problems, the last place we look is the knee—we first assess the movement of the big movement rocks below and above it. The shoulder girdle involves the humerus, glenoid, clavicle, scapula, and thoracic spine. The scapula must glide over the ribs to provide proper and efficient movement of the shoulder joint. And the thoracic spine must move freely in all three planes of motion, especially in the transverse plane. If the thoracic spine has ample motion, the scapula will spontaneously glide over the ribs to allow the shoulder joint to function effectively. However, the thoracic spine depends on freedom of motion in the hip complex, which is impacted by the foot and ankle actions. When viewing human movement, especially of a local joint, first look globally to get a perspective of gross overall tri-plane motion. Then move your assessment to the local joint action. Often referred to as a mobile adapter, the foot must be able to absorb forces from gravity and ground-reaction forces when moving forward and back, side to side, and in rotation. Additionally, the foot must be able to do these actions on firm, soft, level and unleveled surfaces, as well as on a combination of surfaces. There is a predominance of one plane of motion in certain regions of the foot, yet those regions must have a subtle action of the other two planes of motion within them. For example, the talocrural (ankle) joint is said to be primarily a sagittal-plane mover. As the tibia moves over the talus, the motion is in the sagittal plane. However, when the foot hits the ground, contact with the ground is usually at the lateral aspect of the calcaneus. As the ankle plantarflexes and the foot lowers to the ground, the calcaneus everts five to seven degrees, resulting in a relative rotational movement of the midfoot and forefoot as the phalanges contact the ground. At this point, the tibia starts to rotate medially, as do the femur and hip. To envision this, imagine viewing the foot from above as seen in Figure 6.1. Picture a line across the talus and have that line bisect both malleoli. 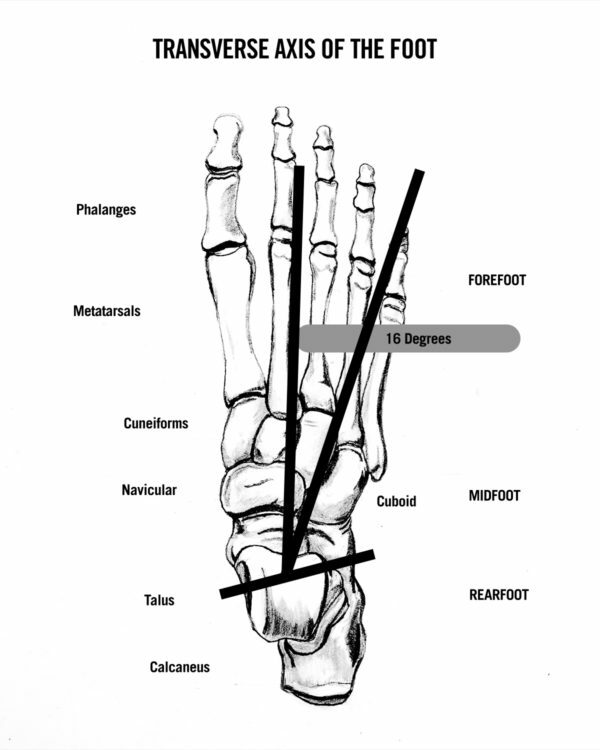 Now add a line from the instep to a point between the fourth and fifth metatarsal bones. This represents an axis that passes through the talus at a 16-degree angle. This axis relates to the motion of the forefoot to the rearfoot when the foot is fully loaded in midstance. The summation of ankle dorsiflexion in the sagittal plane, calcaneal eversion in the frontal plane, along with forefoot abduction through the transverse axis and tibia rotation in the transverse plane allows the foot and ankle complex to be loaded in three planes of motion. If any of these actions become limited, the entire system will be adversely affected and lack proper loading. The hip complex is the conduit region that conjoins the lower extremities to the torso. It must possess mobility to ambulate in three planes of motion, along with stability to assist in absorbing and transmitting forces. The hip is comprised of the spherical femoral head and the acetabulum. Often referred to as the body’s powerhouse, the hip contains the densest, most powerful muscles in the body. Thirty-three muscles attach to the hip complex; many of them exhibit the body’s highest power capacity. Among them are the gluteal complex, deep hip rotators such as the piriformis, gemellae and obturator groups, adductor group, and hamstrings to name those most commonly recognized. Like all joints in the body, the hip moves in three planes of motion. In the sagittal plane, the flexion range of motion is between 100 to 120 degrees and extension is 15 to 20 degrees. In the frontal plane, abduction ranges from 40 to 45 degrees, while adduction is approximately 25 degrees. In the transverse plane, internal rotation range of motion varies from 35 to 40 degrees, with external rotation of 40 to 50 degrees. In standing single-leg balance, we have observed nearly 90 degrees of external rotation. In addition to the tri-plane range of motion, pay attention to the femoral glide that must occur for successful motion. When the hip extends, the head of the femur glides or slides forward toward the anterior. When the hip flexes, the femoral head slides posterior toward the back. In frontal-plane motion, the femoral head slides laterally during adduction of the hip and glides medially during hip abduction. In the transverse plane, the head of the femur rotates backward with internal rotation and rotates forward during external rotation motion. When the hip joint gets tight, the femoral head becomes somewhat compressed in the acetabulum, resulting not only in joint compression, but also with reduced range of motion in all three planes. Therefore, when stretching the hips in three planes, you will be more successful when applying a gentle long axis distraction, pulling the distal bone from the proximal bone. Considering the hip structure and its important role of force transmission, the mobility of the hip is critical for successful and efficient movement patterns. People with back pain invariably have a limitation of hip function within one and most often all three planes of motion. The close relationship of the hip complex with the lumbo-pelvic complex greatly impacts the functioning of the lumbar spine. When the hip is limited, especially in the transverse and frontal planes, the lumbar spine compensates in these planes of motion. Over time, back injury to this region follows. In static posture, anterior pelvic tilt alignment will influence the lumbar spine by increasing lordosis. Likewise, posterior pelvic tilt causes flexion of the lumbar spine. However, the lumbar spine can also influence pelvic tilt alignment, with increased lordosis causing anterior pelvic tilt and lumbar flexion often resulting in posterior pelvic tilt. These issues need to be correlated to your strategies of corrective exercise when developing programs. For example, if a client has an anterior pelvic tilt with increased lordosis, you need to use caution when doing squats or spinal extension movements. The rationale is that the facets of L5/S1 are closer together than in a more neutral position lumbo-pelvic complex. When squatting or moving into an extended spinal movement, the facets may compress, causing discomfort. A lunge program is an alternative to the squat in this situation, as the hip of the forward leg will move into a posterior position while the hip of the trail leg extends. In the majority of cases, this reduces the compressive force on the L5/S1 facets. The client will be able to work the legs and hips with more comfort and efficiency. The interesting cascade reactions of the foot have significant impact upon the hips. These principles will be discussed further throughout this book. The hip complex is a crucial big movement rock based on the alignment and proper motion of the hips, critical function of force transmission and mitigation, and the interrelationship with the lumbar spine. Tri-plane motion of the thoracic spine is critical for successful and efficient movement. The span of 12 thoracic levels lends itself to be mobile in three planes of motion. The excellent book, Low Back Disorder by Stuart McGill, Ph.D., demonstrates the vast range of motion in all three planes. Cumulatively at all 12 levels, the thoracic spine averages 76 degrees in the sagittal plane of combined flexion and extension. In the frontal plane, the average range of cumulative motion is 78 degrees. In the transverse plane, the average is 74 degrees of combined left and right rotation. Compare these ranges to the lumbar spine that totals 68 degrees of combined flexion and extension, 29 degrees of frontal plane motion, and 13 to 15 degrees in each direction of rotation. The primary difference in the range of motion is due to the articulating facet structures of each region. The thoracic spine facets face more posterior and allow the ribs to have greater freedom of movement. The lumbar facets are aligned more obliquely and limit the movement in the transverse plane. 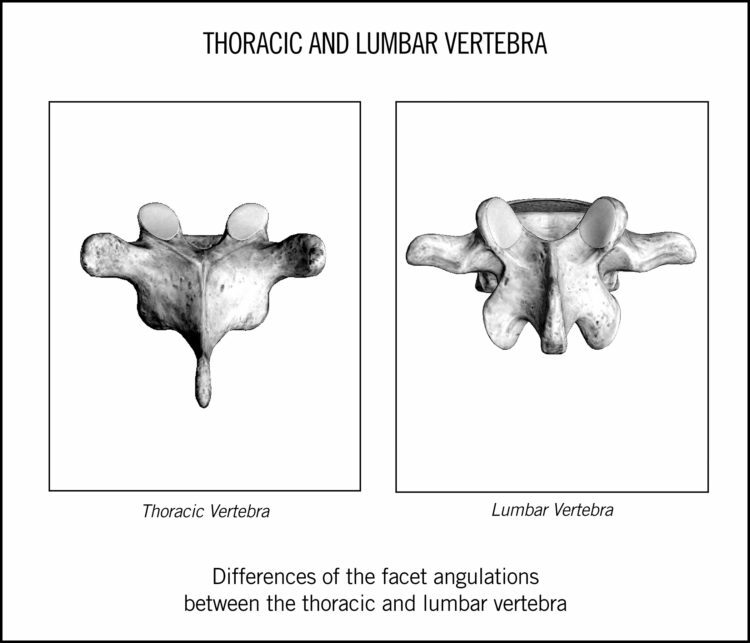 Please refer to Figure 6.2 comparing the differences of the facet angulations between the thoracic and lumbar vertebra. 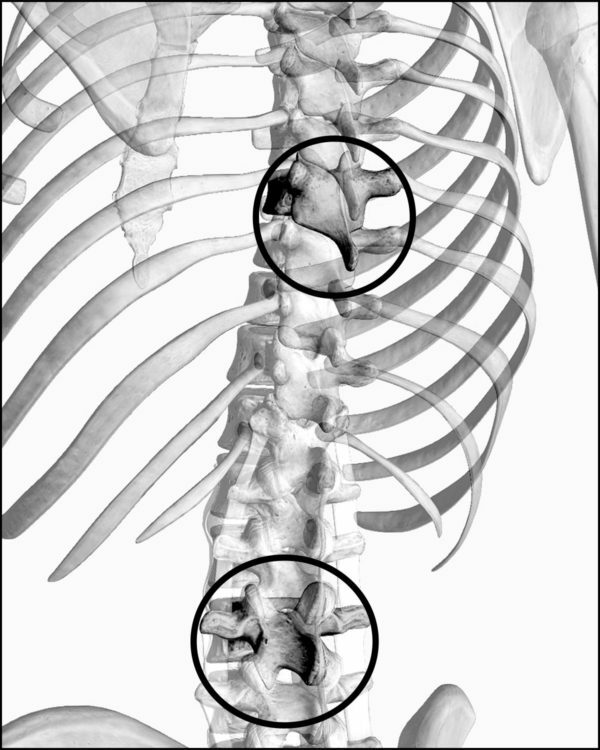 Figure 6.3 below demonstrates the difference in articulation with adjacent vertebrae in each region. The thoracic spine simultaneously functions in three planes of motion. For example, when rotating to the right, the right transverse process moves posteriorly in the sagittal plane, while the vertebral body is rotating right in the transverse plane. This is often referred as a “coupling effect.” However, in many cases there is a slight lateral flexion to the side; therefore, the frontal plane is impacted and movement is occurring in three planes of motion. There is greater motion in the upper thoracic spine from T1–T8 in the transverse plane. Farther down toward the lumbar spine, especially from T9–T12, the rotation becomes less as it approaches the thoracolumbar region. As the thoracic spine becomes more distal, the lumbar spine will influence it—it has less rotation, similar to the lumbar spine. The lumbar spine is conducive to flexion and extension, and the thoracic spine has more range of motion from T10–T12 than the level above it. Frontal-plane motion is fairly consistent through the entire thoracic spine, as it is in the lumbar spine. The articulation of the scapula with the thoracic spine is critical for healthy shoulder girdle and shoulder joint action. There must be good mobility in the thoracic spine to allow scapular gliding over the ribs. This will enhance shoulder-joint mobility and create an environment for healthy shoulder movements. Throughout this book, we will continue to discuss the big movement rocks and their dependency on each other for successful movement. The synergistic cascade of reactions is necessary to allow a successful environment for efficient movement. If any part of these reactions becomes limited in motion, the entire system is affected and compensatory movement patterns will contribute to complete the task. This was an excerpt from Chuck Wolf’s book, Insights into Functional Training.